The vintage movement has come a long way baby. In my twenty three years of involvement I’ve watched the sport evolve from being a fun yet minor fad into the multi faceted international maelstrom that it is today. 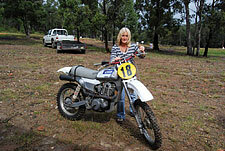 I’ve met the coolest people, built and raced bikes that as a young racer in seventies Australia I could only have dreamed about and traveled the length of my country and the USA racing and in my latter life gig as an ace reporter, chronicling the events, racers and motorcycles that make the world of the vintage off road movement so cool. One of the most rewarding aspects of doing what I do is having the opportunity to meet the riders who were the kings of my motocross universe during the Wonder Years. Among others, I’ve interviewed and drank beer with Roger De Coster, bar hopped Santa Cruz’s seedier taverns with Billy Grossi and drank Margaritas with Jim Pomeroy and Brad Lackey. I’ve discussed Maicos and prostates with Super Hunky and spent a weekend with Bugsy Mann. To a man, all of these icons have been genuinely nice people, all proud of their achievements but refreshingly normal. In April I added another legend to that list. 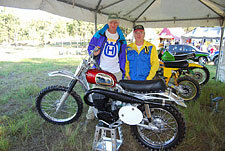 I finally met the motocross icon to top them all, the great Joel Robert. 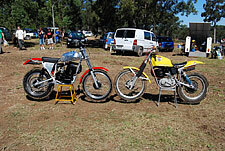 Joel was the guest of honour at the VMX magazine promoted Suzuki Classic Dirt 5 held at the MX Central complex at Raymond Terrace, three hours north of Sydney. 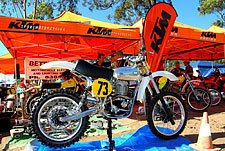 Classic Dirt is the yearly crown in the jewel of the Aussie vintage racing scene with thousands of bikes and riders sharing the love over three days. The unique thing about CD is that there isn’t any racing. 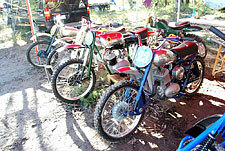 You can ride as fast or slow as you like, as often as you like or just plain show your bikes of in one big show’n’shine. As is the case in most big vintage events these days, Classic Dirt has a history of inviting past greats as marquee drawcards. 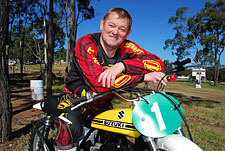 In the past the event has featured such stars as Brad Lackey (twice), Jim Pomeroy, Jimmy Ellis and Rick “Super Hunky” Sieman and the plethora of Aussie legends. You can imagine the excitement that ran through the vintage community when it was announced that the greatest world champion of them all was coming to CD. 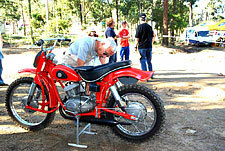 What made it even more exciting was that it was Joel’s first trip to Australia since 1972 and his first vintage event outside of his native Belgium. 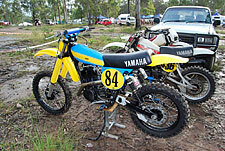 Even though it had been a number of years since Joel has ridden a race bike at any sort of speed, he was excited at having the chance to do some exhibition laps on a genuine RH72 Suzuki works bike, owned by a local collector. 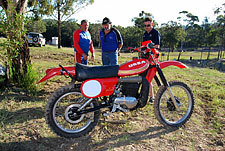 Also on hand for Joel to sample were an RH74 and a rare RN74, both owned by Klub Kevlars Dave Tanner. 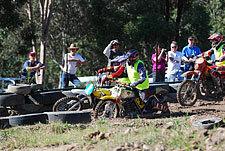 The crowd lined the track three deep when Joel led a bevy of Aussie legends onto the track for the first of the ‘Legends Laps’ sessions. 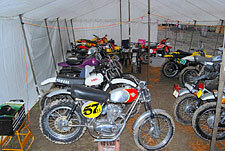 They say that a racers soul never goes away and that was proven as soon as the legends were flagged away. No slow laps, waving to the crowd for this lot, they got straight into race mode, despite the fact that many of them hadn’t sat their butts on a race bike in years. As expected, Joel led the gaggle of old champions on the first lap and was looking much younger on the bike than his sixty plus years. You could imagine the smile on his face as he dived into the sharp left hander adjacent to where I was standing. 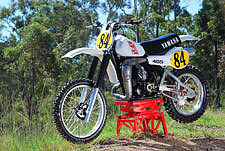 He had been hotly pursued by Danish born 1972 Australian 250 champion Per Klitland and as the two old champs entered the corner, Per took the opportunity to stick the wheel of his 440 Maico under Joel in what Per later told me had been intended as a bit of gamesmanship for the crowd. Unfortunately Joel wasn’t in on the plan and they collided, both falling heavily. The pair quickly got up and Per got moving again but Joel was holding his shoulder and walked to the infield as track workers moved the priceless RH before someone ran over it. Luckily Joel only suffered a tweaked shoulder that came good with a bit of attention but Per was far worse. 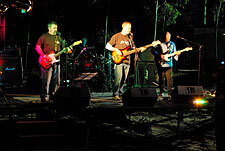 When he came back into the Klub Kevlar pit he was a shattered man. He was almost distraught at the thought that he had taken Joel out of the event, ruining the show for the fans. We tried to console him with Danish beer and lighthearted crash and burn jokes but he was genuinely upset. Eventually we got the two old Euros together and they shook hands and laughed it off, as Joel later said, “two silly old guys in their sixties thinking they were twenty again”. 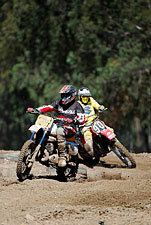 Both riders returned to the track in later sessions and kept way apart from each other! Joel Robert and Per Klitland come together bringing Joel to the ground. 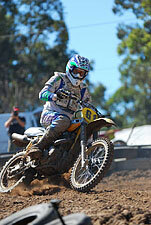 Joel may have been a little rusty on the track but off the track he was a very slick operator. 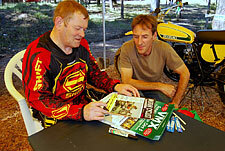 He patiently signed hundreds of autographs and seemed to have a story or joke for everyone. Even though his English isn’t 100% he gave a brilliant speech and Q&A session after Saturday night’s banquet and his stories of the life of a GP legend had everyone there enthralled. The man is a class act. 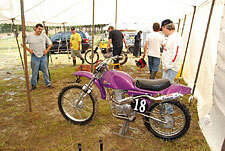 VMX founder Ray Ryan was a firm believer in the theory that a major percentage of vintage fans were non racers who just loved restoring and showing of their bikes. He also figured that if you gave them an opportunity to ride their bikes without the stresses involved with racing they would come in droves. 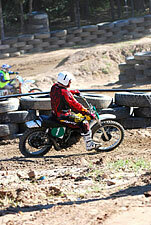 Rays vision proved correct about ten minutes into the first Classic Dirt event in 2000. 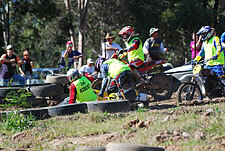 From that first event at rural Kyneton, Victoria the non competitive concept has grown in leaps and bounds. 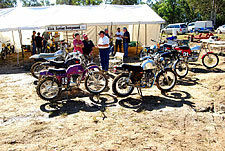 Not only is it an opportunity for the vintage fan to show and ride their precious resto, it’s also the worlds biggest bench racing session, beerfest and barbecue. It’s a chance to show off your best chili recipe or your expertise at creating the most exotic margarita. It’s an opportunity to meet guys who are just as stoked about old dirt bikes as you are and to dance like a fool to the covers band. 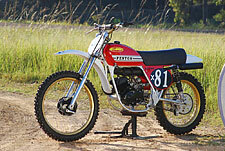 Classic Dirt is our sports Woodstock. It’s amazing that the concept hasn’t taken on in the USA or the UK where there is I’m sure, an equally keen non racing vintage fan base. Surely it can’t be long before some budding American entrepreneur sees the value in these events and sets one up. When that happens, a whole new door of vintage enjoyment will open, proving that Ray Ryans vision isn’t just an Aussie thing. This bike is too cool. 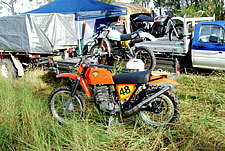 It’s the only Australian built bike to ever win an Australian Championship in any discipline. 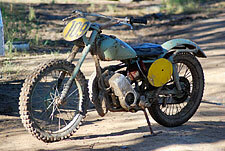 It’s the 1961 Australian 125 MX championship winning Victa 125.